I spoke with Susan Harmon the day before the funeral, and she said to tell you thank you for the posting of the article on Larry. She appreciated it and said that he would have loved it. His daughters also said to say thanks. Kevin and I attended the funeral, and it was just family and close friends at Mt. Sinai near Burbank, CA, on Monday, July 7, 2008. We will miss him. He was a friend, mentor, and employer of ours for a span of 21 years. Kevin was at Canobie Lake Park in Salem for a total of 11 years, and traveled around the world as Bozo representing Larry Harmon Pictures Corp., for all of those years. We loved him. I can truly say that Larry Harmon was the most exuberant human being I have ever met. He loved life and his world, and felt blessed beyond belief, and he laughed all the time. And he always said hello to everyone he saw, and said something pleasant to them to make their day lighter and happier. No matter who, what, where or when. Stranger or friend. He always laughed with all of us, and it spread like wildfire. He was a good man, and a very funny man, a good spirit. Susan and Marci say they plan to keep the company going like before, and to keep the characters out there in the world like Larry wanted them to do. So, no major changes. Thanks for your note. We do appreciate your kindness. 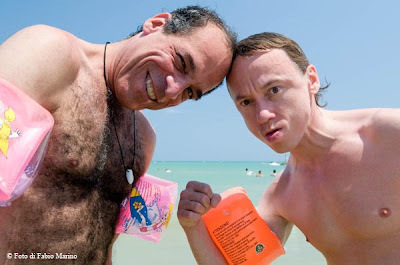 Peter Shub and Jigalov in Funambolika 2008, Pescara. Cirque d'Hiver Bouglione de Paris' 2004/05 production, Bravo. 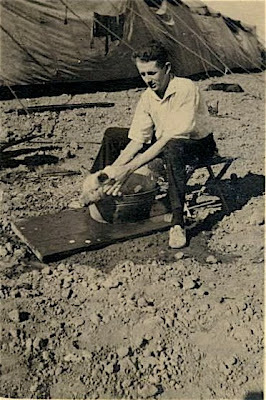 Three photos, all identified as Lawrence Swalley (although I think that the middle one may be Bobbie Warde), including Mr. Swalley out of makeup and washing his pig. No method acting, no "message", no "spaghetti". 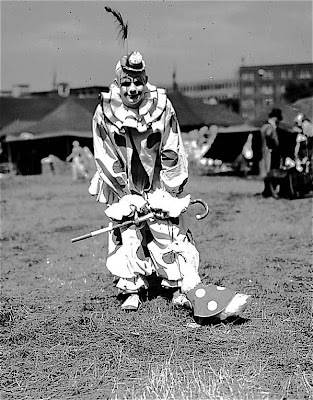 Just a clown, being a clown to the delight of children of all ages. The name of the show that they were on is nowhere to be found, simply their name and faces. 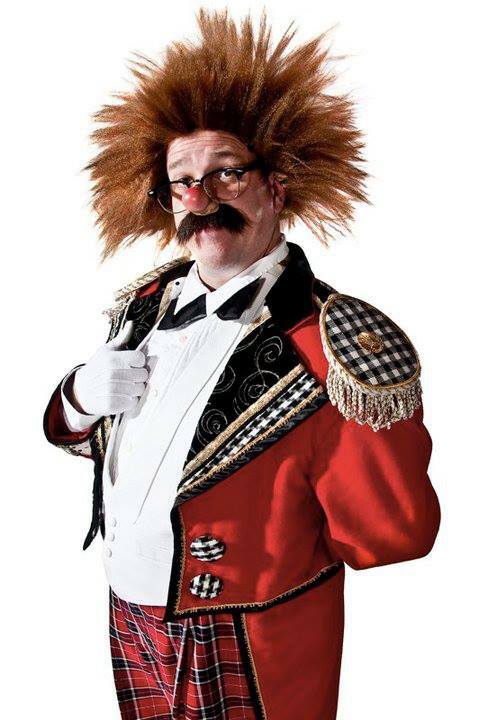 Other than Grock and possibly Rivel are there any other examples of a clown act that was so well known that the name of the show didn't even need to be included in the advertising? 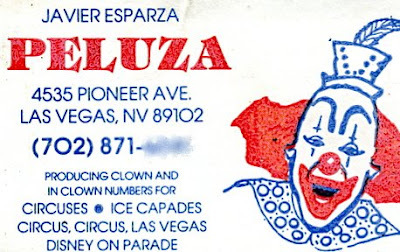 I recently found this scan of one of Peluza's business cards in my "bulk mail" folder where it has been sitting for weeks. Thanks to the Hall family for sending it! 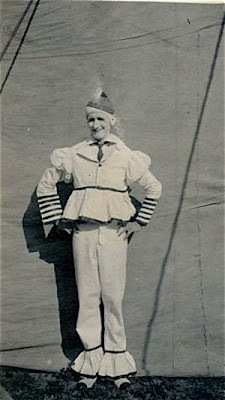 Peluza had a long career as a clown on the Shrine circuit and is best remembered for wearing a makeup and costume very similar to Jimmy Stewart's "Buttons" in the movie The Greatest Show on Earth. Peluza is still in Las Vegas somewhere. Has anyone heard from him recently? "The way I feel about life is, just keep laughin'!" At 36, on the way to the bank, Larry Harman can afford to. He not only has world rlghts to Bozo the Clown; he practically IS Bozo the Clown. 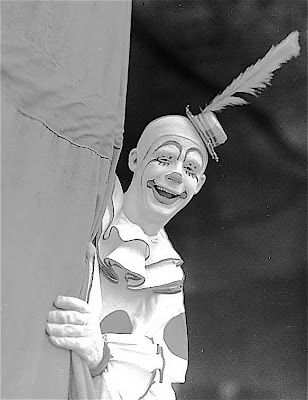 In a decade Bozo has gone from phonograph records to television to in persons; soon he will be in feature pictures. Beyond these looms Bozoworld—many Bozoworlds, all over the country, but the first one right here in north-western Los Angeles. "Today," he said, lapsing back reluctantly in to Larry Harmon. 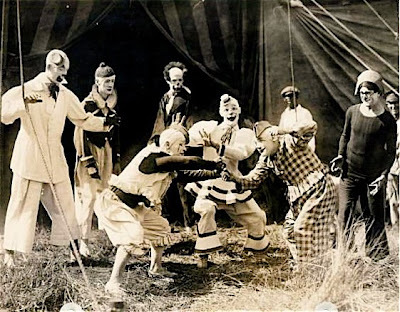 "I have over 60 Bozos in the U.S.A. and over 12 throughout the world—and I trained 'em all! Bozo, on 35-mm. film and in color where there is color, is carried by 205 TV stations worldwide. We have made 104 half-hour shows and right now we are on the second 104. But our big aim is features—family entertainment! 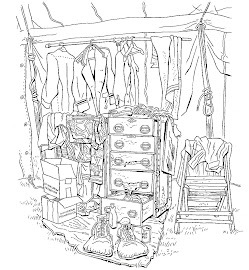 One is already on the drawing boards and two in the story-planning stage. They will cost from $600,000 to $1.2. million each." 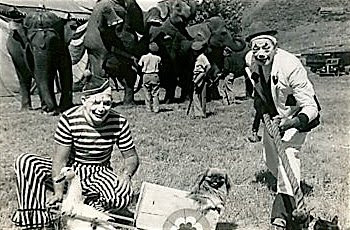 An erstwhile musician and actor, Harmon heard in 1950 that TV was interested in Bozo, who in his present incarnation was created some 20 years ago by CapitoI Records; "Bozo at the Circus" was the first album and Bozo's picture was on it Harmon was advised to go out and cut a record of his own; if his voice sounded more like Bozo than his nearest rival he'd get the job in the pilot film. P.S. : He did. "Four years ago," he declared, "I obtained the rights from Capitol and started making the cartoons myself. I borrowed $1 million and paid it back in two years. We're out at the old California studios and we now have about 200 people working for us. We started with 125." 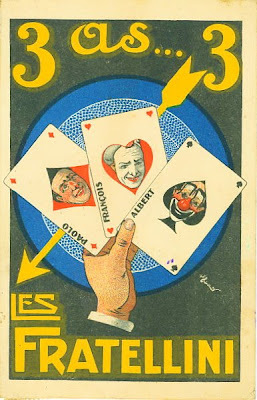 The 60 U.S. Bozos will appear with the theater features in the various cities. "Think what that will mean!" Harmon cried. "The live star of a movie, in person, at each showing!" He has also cleared the cartoon rights to Laurel and Hardy. They should be on your home screen by 1962 and in the theaters soon after. Harmon will be the voice of Stan Laure—natch. The only surprise is that he won't play Ollie too. Are you laughin'? 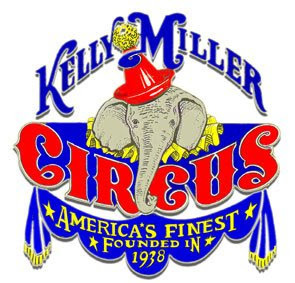 This doesn't look to be the Moscow Circus but rather a "Moscow Circus". 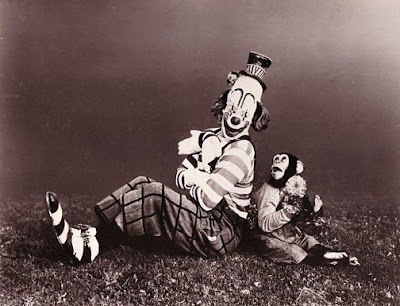 I think that it's interesting documentary interview footage of two brothers, and 2nd generation clowns, nonetheless. I'm really missing the show right now and wishing that I was there. I hope that everyone on the big K-M is happy, healthy and working on a nice dry lot today to turn away business. 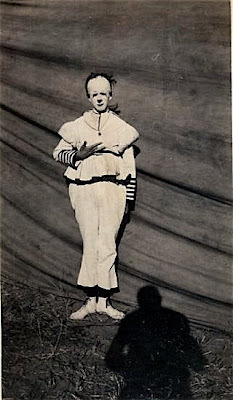 The clown in the rear center, framed by the doorway and wearing a frightwig is Prof. Paul Wenzel. 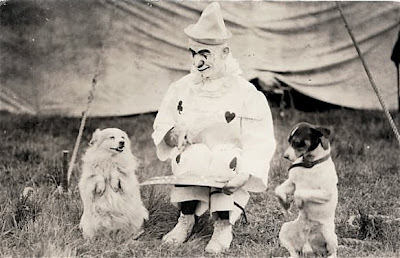 The clown in the glasses on the right looks like it may be Earl Shipley. But take those glasses off and Earl Shipley here becomes Bill Strong's Mystery Clown. Have we finally solved the big mystery? I'm not sure but this one looks to me like it could be Dukie Anderson. Harry Dann doing his best impression of Chuck Mangione's Feels So Good album cover. For you fans of King of the Hill, Mr. Mangione will be appearing at the Meg-Lo-Mart in Arlen, TX next weekend. 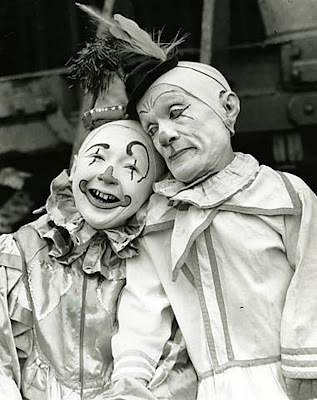 Terri Hall from the International Clown Hall of Fame called yesterday to tell me that she has been "up to her eyeballs" in nasty phone calls and emails concerning the ICHOF's rescinding of Larry Harmon's "Lifetime of Laughter" Award. The award was rescinded by the ICHOF's previous administration when they discovered that Larry hadn't created Bozo the Clown. Terri had informed Greg DeSanto and I last month that Larry's award wasn't given for creating Bozo, it was given for perpetuating the Bozo character. As such, she had decided that he deserved to be reinstated and that an award ceremony was planned for September. Unfortunately, Larry passed away this past weekend before any of this could be made public, the story about the ICHOF rescinding his award was mentioned in AP obituary that ran across the country and she has been buried under a pile of hate mail ever since. 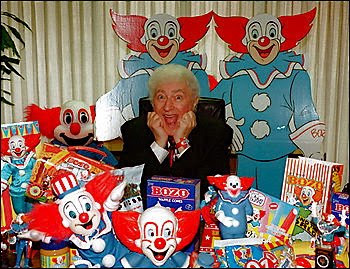 In September, 2007, I became the Director of the International Clown Hall of Fame. 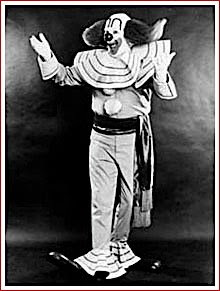 One of my main objectives was to create a new and exciting website that people could learn more about the Art of Clowning. While reviewing all the biographies of the inductees, I ran across the list of Lifetime of Laughter Achievement award recipients. 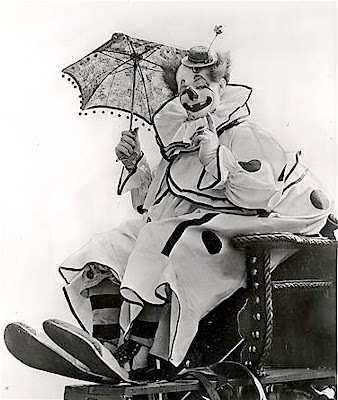 I felt it would be good to show people on the website that we recognize clowns who have dedicated their lives to preservation and promotional of the art of Clowning AND people who may not have a clowning background but have created a happier world providing humor and laughter. At our website, www.theclownmuseum.org, you will see that Larry Harmon is clearly listed as the 1990 Lifetime of Laughter recipient. 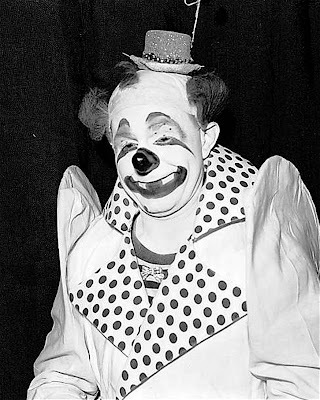 In the inductee and lifetime of laughter receipient files as well as on the Internet, there is an article written by I assume a journalist or reporter indicating that the ICHOF inducted the wrong Bozo the clown based that the information provided by Larry Harmon was inaccurate. I also found a letter rescinding his award. 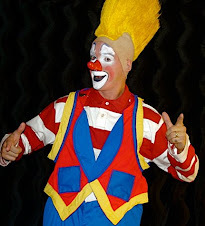 In reviewing all facts, Larry Harmon was not inducted into the ICHOF as the "original Bozo" or any other Bozo nor did he give us any information indicating he created the original Bozo. 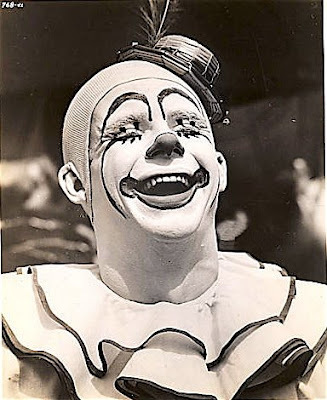 He was given the Lifetime of Laughter award because he provided "wonderful entertainment and happiness" to all those who loved Bozo the Clown. He also provided laughter for those who loved the Laurel and Hardy series. Larry Harmon bought the rights to the Bozo character and the Laurel and Hardy comedy team. He kept them on TV and presented his version of a Bozo that I as a child remember quite well. 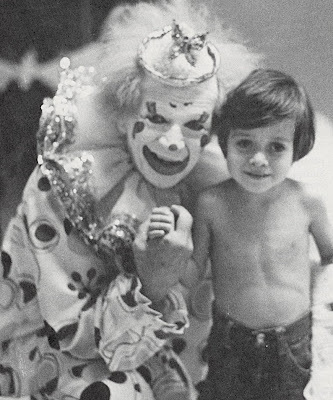 I had the priviledge twice as a child to see Bozo the Clown in Chicago. 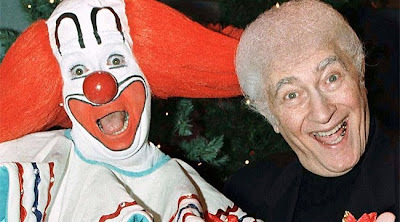 I loved the Bozo he created and it definitely left a great smile in my heart and memory. Larry Harmon is on our website listed as the 1990 Lifetime of Laughter Achievement and this award was earned by him. The original news article was incorrect. 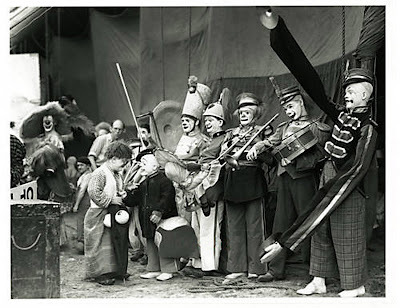 Only clowns are inducted into the ICHOF. Our information should have been updated to say he created a new version of Bozo the Clown. Based on my research presented to our complete board, Larry Harmon deserved his award and his plaque will definitely be hung in our Hall of Honor. We had already corrected our website and were working with friends of Larry's to inform him of his reinstatement. We were asked by his friends to keep silent and not leak it to the press until after the arrangements were made to show him that his award was truly earned. Unfortunately, we will not be able to complete that surprise but he earned the award that he was given. My condolences to his family and friends. I am sorry for the confusion and hope that Larry knew in his heart that his contribution to laughter, humor and fun were appreciated around the world by children of all ages. 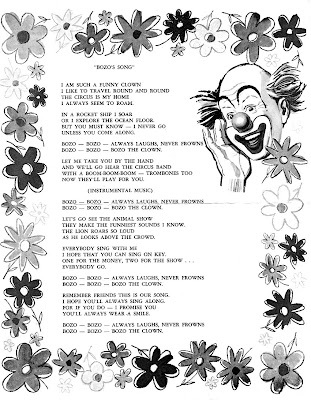 And now, courtesy of Tommy Holbrook, the complete lyrics of BOZO'S SONG, written by Alan W. Livingston and Billy May and performed by Pinto Colvig and the Billy May Orchestra. 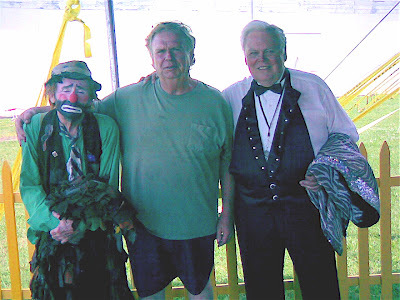 Emmett Kelly's son, Pat Kelly with Jimmy Hall and Jim Fugate at the Circus Hall of Fame in Peru, Indiana. Same Big Apple Circus Water Gag from last week with Joel Jeske and Barry Lubin but with the inclusion of Francesco. 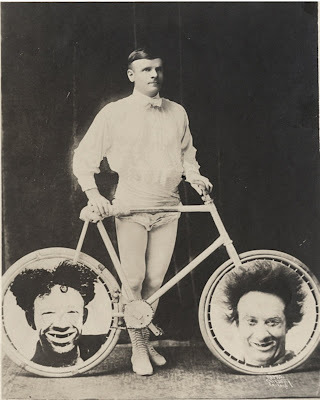 I don't know anything about the act, tbicycle rider or the clown on the lower left but the clown in the lower right is Lillian Leitzel's uncle, the very funny Bluch Landolf. 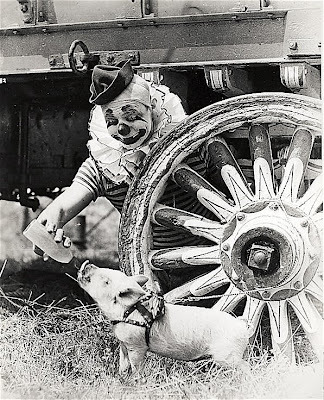 Felix feeding one of his many pigs at the Ringling Sarasota Winter Quarters in the 1930s. Lou Jacobs is in drag on the far left. 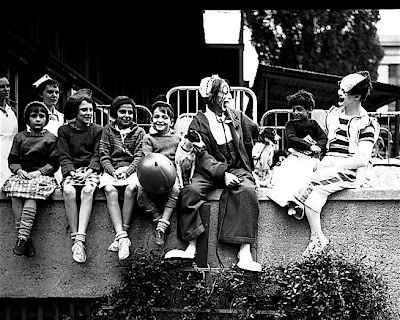 Dukie Anderson is in the pith helmet. Highlights from the 2008 parade including footage of Jerry and I performing with the comedy car. I had a really great time this week visiting patients and staff at Jersey Shore University Medical Center in Neptune, NJ. 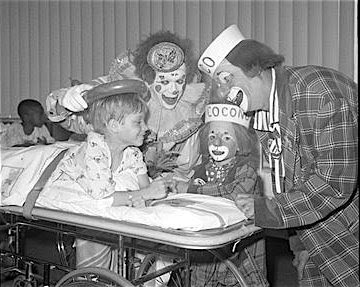 "Every hospital should have a clown and every clown should have a hospital." 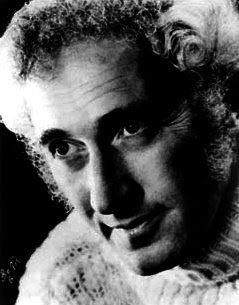 Harry Dann before the elements of his classic makeup and costume were set.